Just like how we calculated the present value of future annuity payments now, we can calculate the vice versa meaning we can calculate the future value of cash flow payments (PMT) given a present value today. Remember in these calculations, we do not need the Future value (FV) information. Let’s take an example; suppose you want to start up a new business and need $100,000 to start up, market and run your business. Because you feel the business will be short lived for some reason, you would like to pay off this $100,000 balance in a set of five equal payments. 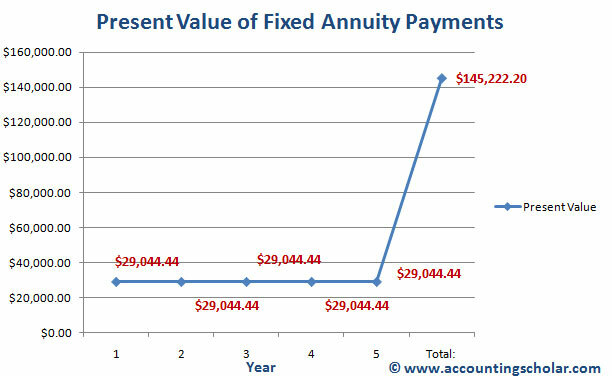 Given the interest rate is 14%, what will your monthly annuity payments (five of them) be? This therefore means you will have to make annuity payments of $29,044.44 every year for the next 5 years to pay off the $100,000 loan at 14% interest rate. Below is a graphical representation of this data.